You've probably heard the song, Hot Cross Buns- especially, if you've ever learned to play a musical instrument. 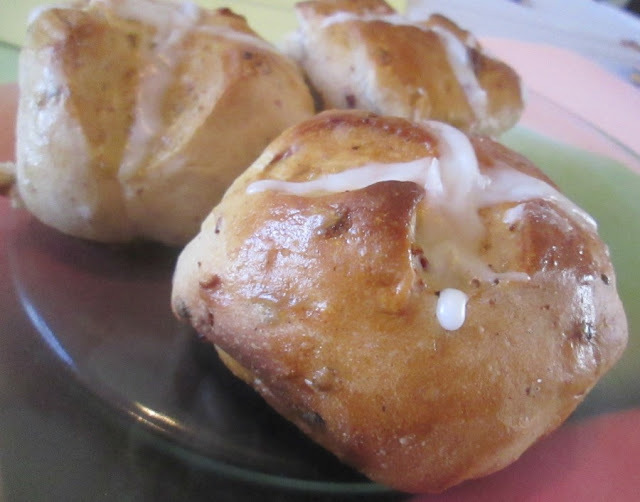 But, have you ever eaten Hot Cross Buns?Hot Cross Buns are traditional Easter breads made with dried fruit, such as currants or raisins, with a sugar icing cross on top. 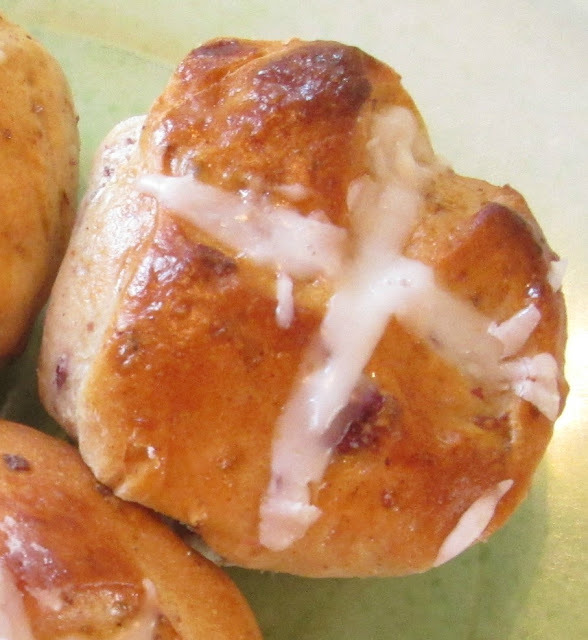 So, if you are looking for recipe ideas for Easter, you might want to make Hot Cross Buns. If you don't like to bake, just you can play the song. We've included the song lyrics at the bottom of this post. Enjoy! Traditionally, Hot Cross Buns are eaten on Good Friday. Feel free to experiment with the fruits. Dried cranberries or apples also work well. Just choose your favorite! 1. Combine water and 1/2 c. milk in a small saucepan. Heat to 100-110 degrees F. Remove from the heat and sprinkle the yeast on top. Allow the mixture to sit about 30 minutes. 2. Whisk the butter, egg yolk, and vanilla into the yeast mixture. 3. In a large bowl, combine the dry ingredients (flour, salt, and spices) Make a well in the center and add the yeast mixture. Mix with a wooden spoon until the dough is slightly sticky. Add dried fruit. Knead the dough on a floured surface approx. 8 minutes and shape into a ball. 4. Grease the inside of a bowl. Add the dough and cover with plastic wrap. Allow it to rise in a warm place until the dough is doubled in size, approx. 2 hours. 5. Pat the dough into a rectangle about 16 x 8 inches. Divide into 12 equal pieces with a sharp knife. Turn under each piece so that it forms a ball and place seam-side-down on a greased baking sheet. 6. Cover with plastic wrap and allow the dough to rise in a warm place until doubled in size, approx. 45 min. Meanwhile, preheat oven to 375 degrees F.
7. Remove the plastic wrap. Make a cross-shaped cut on each bun with a sharp knife. Brush the tops with the beaten egg white. Bake until golden, approx. 20 minutes. 8. For the icing, mix the confectioner's sugar, milk, and vanilla in a small bowl. Using a toothpick, apply icing to the cross pattern on the buns while still warm. 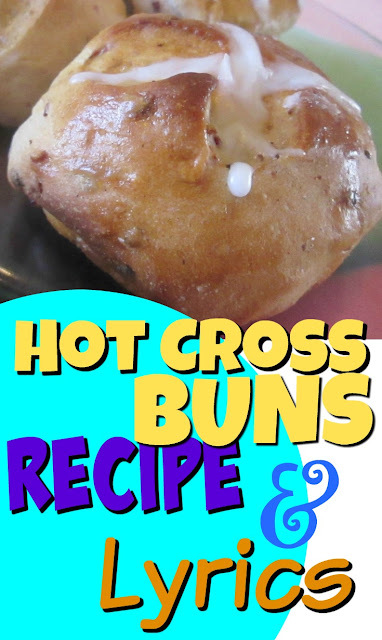 How to make Hot Cross Buns and sing the song too!